How Does A 2mm Needle Kill the Emperor of all Maladies--Cancer by Heat? Due to minimal trauma, quick curative effect and little side effects, Microwave Ablation (MWA) has become an important treatment for the emperor of all Maladies - Cancer. According to the reports, when using MWA for cancer treatment, we only need to introduce a 2mm dia. microwave ablation needle which can release energy, into the tumor precisely guiding by imaging devices. Usually it takes 10 minutes to ablate 6cm tumor in diameter. How could this be achieved? We will uncover the secret for you together with Professor Peng Xiaochi from Modern Cancer Hospital Guangzhou. To Ablaze the terrible tumor by a 2 mm dia. needle, where does the lethality come from? Professor Peng Xiaochi introduces that the secret lies in the head of the microwave ablation needle. According to Professor Peng Xiaochi, when conducting Microwave Ablation, the doctor introduces the microwave ablation needle into the tumor percutaneously under the guidance of ultrasound B and CT scan and other imaging devices and then the needle outputs microwave. At this time, the needle heads are equivalent to a “mini-microwave”, which persistently releasing microwaves. Polar molecules in the tumor tissue will perform high-speed movement under the action of the microwave field; generate heat to warm the tumor tissue. When the temperature rises above 60℃, the proteins of tumor cells will be denatured coagulation, resulting irreversible tumor cells necrosis. Under Microwave Ablation, when tumor tissue is killed by heat, it can also produce heat shock proteins, which have effect on stimulating the patient’s immune system, improving immune function and playing a role in inhibition of tumor cell proliferation. Since microwave ablation needle has the super power to kill tumor cells by heat, then will it burn the human body, mistakenly hurt other normal tissues thus cause significant damage to the body? In this regard, Professor Peng Xiaochi indicates that, firstly, the head of microwave ablation needle will release microwave intensively only when it has introduced into the tumor tissue. What’s more, the lethal range is adjustable according to the tumor size. It can ablaze the tumor accordingly and have minimal damage to the surrounding normal tissue. 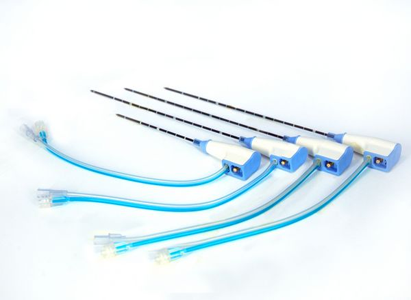 Secondly, microwave ablation needle has a water circulation system, allowing the temperature of central position of the needle to maintain at an acceptable range. Thirdly, microwave ablation needle only has a diameter of about 2 mm, when punctured through the skin and other organs and reaching to the tumor tissue, it brings minimal trauma to the skin and other organs and won’t cause major harm to the human body. Comparing to the surgery, chemotherapy and radiotherapy, MWA has little side effects, high security, less pain, better treatment efficacy and many other advantages. Therefore, MWA is very suitable for the patients who cannot bear general surgery or unwilling to take surgery, and those who have tumor metastasis, tumor recurrence or other types of cancer patients.